GOAT meat prices have held steady at above average levels as exports continue to flag on the back of lower eastern states slaughter figures. 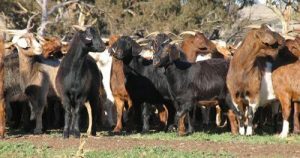 Meat and Livestock Australia said from May until the end of winter, goat over-the-hooks indicators increased steadily, although they seemed to have plateaued somewhat during spring. Despite levelling out, the indicator remains above year-ago levels and the five-year average. The 12.1–16kg carcase weight (cwt) OTH indicator has remained stable for the past six weeks at 538c/kg cwt, an increase of 48 cents from where it was at the start of the year. MLA said for the week ending 23 November, eastern states goat slaughter was 13,937 head, down 45 percent from year-ago levels and remaining below the five-year average. Year-to-date goat slaughter across the eastern states is 1.13 million head – down 23pc, or almost 335,000 head, from the same period in 2017. Victoria has seen the steepest decline in slaughter, down 41pc from this time last year, while the number of goats processed in South Australia has dropped by 23pc, and from the Queensland/NSW region slaughter numbers are down 7pc. MLA said year-to-October goat meat export shipments totalled 18,639 tonnes, down 26pc, or more than 6000 tonnes year-on-year. Volumes to the United States have declined 25pc for the year-to-date, compared to 2017, largely due to the reduction in available stock this year. The US is Australia’s biggest export destination for goat meat, accounting for 67pc of the nation’s shipments. Australia’s other major goat meat export destinations, Taiwan, Canada, Trinidad and Tobago, have also recorded lower shipments year-on-year, MLA said.